-1993 Attended Bobby Rahal Fantasy Camp at the Mid Ohio School for an introduction to road racing. -Fall of 1994 attended the Bob Bondurant racing school in Arizona for the first time, visited 65 times in the next ten years. -1995-1996 participated in SCCA Solo 2 for two years. -October 1996 participated in VSCDA Children’s Museum Vintage Grand Prix at IRP in a Gene Felton prepared 1990 Pennzoil Pontiac Grand Prix, first vintage race. -1996 Joined HSCRG, Historic Stock Car Racing Group for participation in HSR Group 8 racing a #2 MGD livery 1994 Rusty Wallace/Penske Ford Thunderbird stock car. -1998 Acquired a vintage race prepared first generation Camaro for participation in HSR Group 5 and SVRA Group 6. -1998 Built 14,000 ft2 Team MGD racing shop in Wellington Ohio to support three Team MGD Historic stock cars and three first generation vintage Camaros for Team MGD racers. -1999 Won HSCRG/HSR Group 8 stock car points championship after a year of no DNFs and many lucky breaks. -2005 Awarded the coveted HSR John Benett plaque at the season ending banquet. -2006 VIR heavy single car crash at the end of the back straight in 1967 Camaro demolishing the car. Mild concussion. -2007 Awarded the first ever Charlie Earwood “Flame of Excellence” award. -2008 Participated in the Rolex 24 Hour Race at Daytona in a GT a Mustang owned by John Farano, co driven by John, Carl Jensen, Jim Bradley, and Boris Said. DNF with Transmission issues but an amazing bucket list experience. -2009 Sat out racing for the year. 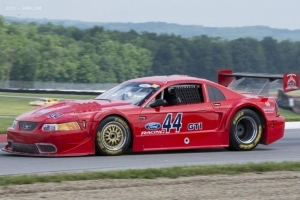 -2010 Acquired the 2000 Cobra Mustang “Entrepreneur” Gt1/Trans Am car for SVRA Group 10 racing. 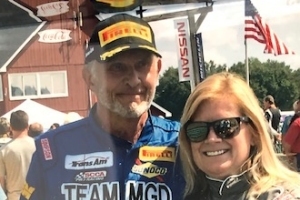 -2011 wife Debbie began her racing career along side me. She was SVRA Rooky of the Year for 2011. -2014 Sebring December year ending enduro, demolished 1995 Cobra Mustang Motorola Cup Mustang in a single car crash resulting in injuries the took me out of racing for 18 months. -2016 Mid Ohio returned to Vintage racing at the SVRA June Vintage Grand Prix event. -2017 Won SVRA season TA class Enduro Championship in the #23 1970 Boss 302 Mustang and in the #44 2, GT4 dash series champion in the 2000 Cobra Mustang . Won the Gold Helmet race in the 1970 Mustang in the SVRA National Championship race. -2018 Won SVRA season championships in the Group 6 TA Boss Mustang and the Group 10 Cobra Mustang. -2018 Awarded the coveted SVRA Diver Of The Year award and trophy, an honor beyond “winning”.